Remember those video game guide books that were sold in the magazine section at local book stores? Imagine if someone took one of those and turned it into a gorgeous hardcover coffee-table book with high quality images throughout. That’s what it felt like reading The Book of Alien: Augmented Reality Survival Manual by Owen Williams. 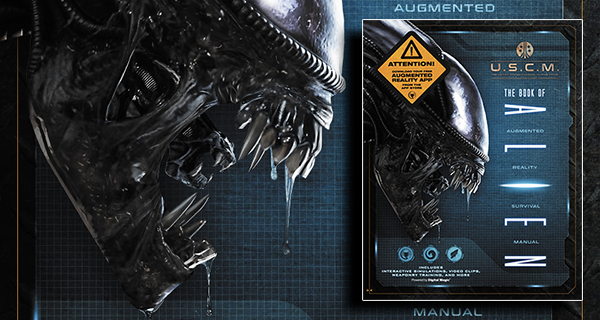 The book, from Harper Design, doubles as a beautiful assortment of photos and artwork from the Alien franchise as well as an interactive game you play on your phone. Alien: Covenant, the newest chapter of the Alien film franchise will hit theaters in just a few short weeks. In that time we are likely to see a lot more clips and learn a little bit more about the franchise itself. 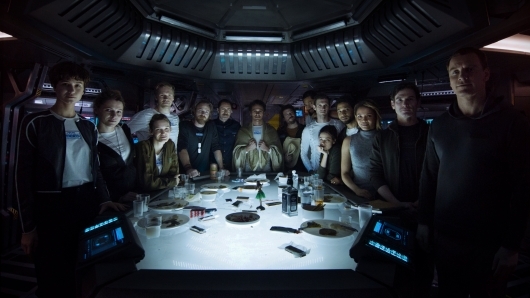 Among those things we are learning, director Ridley Scott admits that he made a few mistakes in Prometheus. Also, when the next film starts production. And that’s not all. Fox has also released a new clip, that just reinforces my absolute fear in the idea of facehuggers. Check it all out below. 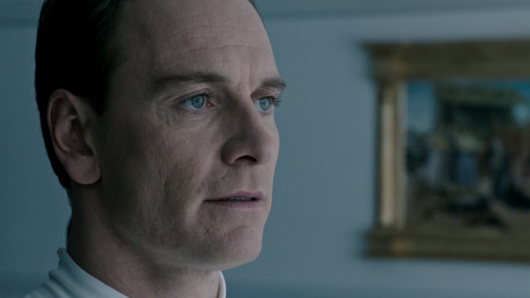 Michael Fassbender and Katherine Waterston are currently the only actors confirmed to be in the cast of Ridley Scott‘s next Alien movie Alien: Covenant, the follow-up to Prometheus. The film is still rounding out the cast, but the latest news may prove to be a surprising one. 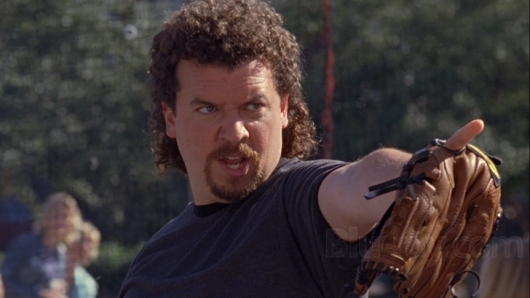 According to new reports, Danny McBride (Eastbound & Down, This Is The End) is in talks to join the cast. More on the story below. Ridley Scott has changed the Prometheus sequel in the past few months since he’s gone on the press tour for The Martian. The film has gone through a couple of title changes and has even bumped Neill Blomkamp’s Alien 5 film into an indefinite hold – though some close to the film believe that it will still be made. But while at a press conference in Australia, Scott talked a little bit about his upcoming Alien film, which he says is the start of a brand new trilogy, which pretty much confirms that Blomkamp’s Alien 5 will not be happening any time soon, if at all. A few months back, Ridley Scott announced that he would follow up his hit sci-fi film The Martian with Prometheus 2. 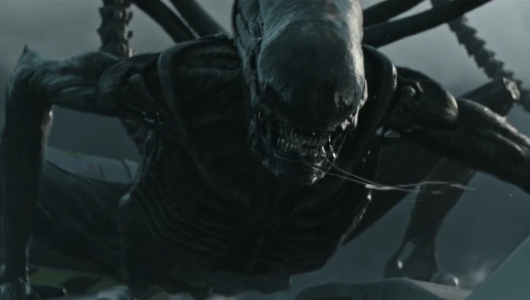 Many had speculated that the sequel would have been the director’s next project, but he then confirmed that the film wouldn’t be called Prometheus 2; instead it would be titled Alien: Paradise Lost. The film put Neill Blomkamp’s planned Alien 5 in a very tough position, forcing the District 9 director to put his Alien film on hold. Spectre scribe John Logan was recently brought in to do some of the rewrites for the Scott’s sequel, and at the same time a rumor popped up that Alien: Paradise Lost would be getting a new title. Now, Fox has announced that the film won’t be titled Prometheus 2 or Alien: Paradise Lost, but rather Alien: Covenant. More on the story below, including the official synopsis. 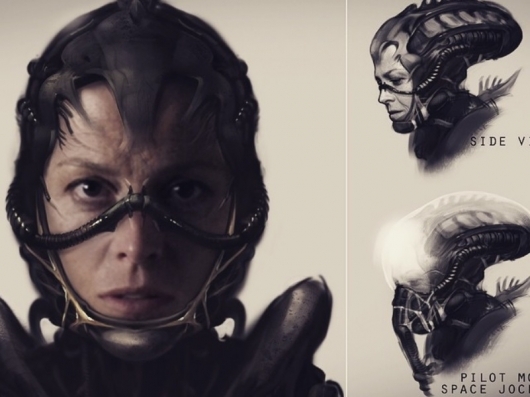 When Ridley Scott announced that Prometheus 2 would actually be Alien: Paradise Lost, there were a few wondering what would be happening to Neill Blomkamp’s Alien 5. After all Sigourney Weaver did sign on for at least two Alien films, and the actress did speak about the film that would have been a genetic sibling to the first two Alien films. Not to mention Blomkamp recently confirmed that the pulse rifle would be making a return. But there were rumors that Scott insisted that Prometheus 2 (which is what it was called at the time) be made first. This essentially would have delayed Blomkamp’s Alien 5, giving more time to the director to work on his script. Now that rumor is starting to look more like a reality as Blomkamp has confirmed that his Alien 5 has been delayed indefinitely. More on the story here below.